Boothbay Harbor is home to a number of incredible coastal restaurants that range from traditional to excitingly unique. Mostly known for famous fresh seafood, these Boothbay Harbor restaurants include some of the very best local ingredients in their dishes. To ensure that you and your taste buds don’t miss out on any of these delectable dishes, we compiled a list of our favorite restaurants near our inn. And, this is just the first course of your Boothbay Harbor experience of delicious cuisine, thrilling adventures, and beautiful scenery. Check out our free Vacation Guide to see even more of the highly recommended restaurants, attractions, and hidden gems Midcoast Maine has to offer. Get a Taste of Maine! Located in a 1960’s sea captain’s home, The Thistle Inn offers a casual bar menu as well as a fine dining experience. Enjoy a meal in the Dory Pub, one of the intimate dining rooms or on the deck under a canopy of trees. The Inn has a popular nightly happy hour with half-priced drinks and appetizers. 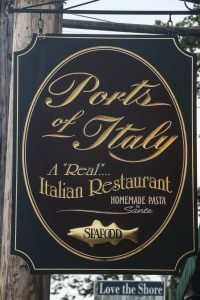 For those looking for an innovative fusion of traditional and modern, Ports of Italy is one of the best Italian Boothbay Harbor restaurants you can choose. Made with locally grown and distributed ingredients, the food at Ports of Italy is fresh and tasty. Specialties include homemade spaghetti, raviolis, bread, desserts and more! Enjoy breakfast, lunch, and dinner all at Harborside Tavern a short walk away from the Topside Inn. It’s one of the best spots for casual dining by the water and to experience the many tastes of Maine. Make sure you stop by for happy hour and try some of their popular cocktails! Part of the Boothbay Craft Brewery, the Watershed Tavern serves authentic pub fare, including some of the best fish & chips in the area, of course using their own ale in the batter. Feel free to grab a pint at the brewery after your meal — you’ll be glad you did. This working lobster pier has a seafood market, full-service restaurant and pub, often featuring a local musician or two during happy hour. At Robinson’s Wharf, you can enjoy fresh steamers and lobster right out on the docks. Fried seafood baskets, burgers and some unexpected creative dishes are waiting for you just across the bridge on Southport Island, well worth the few-minute drive. Kaler’s Restaurant is another delicious source of seafood in Boothbay Harbor, Maine that specializes in fresh crab and lobster. Dishes include delicious haddock, full clams, and more. No matter which dish you choose, your taste buds will thank you. 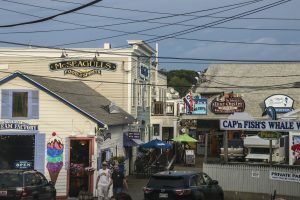 McSeagull’s is a classic Boothbay restaurant that specializes in seafood dishes and features an exceptional coastal atmosphere. 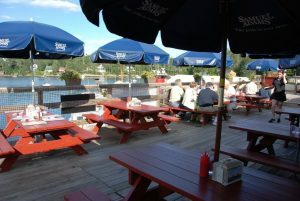 Diners have a front-row view of the Boothbay Harbor Marina on their expanded deck. Take in the sunshine while enjoying dishes like their haddock piccata or the sesame tuna. 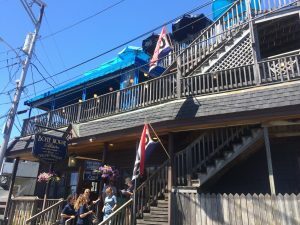 You can find some of the best oysters and live entertainment at this Boothbay Harbor raw bar and gathering place! Mine Oyster is the perfect spot to get your fresh Maine seafood fix while enjoying a gorgeous view right on the water. Stop by and pick up some fresh lobsters to go or sit down and crack open the deliciousness on their outdoor deck. Either way, the Boothbay Lobster Wharf has what you’re craving. It’s an actual working wharf that doubles as a popular eatery with boat-to-table cuisine. The Boathouse Bistro is one of the best tapas bar and restaurants in Boothbay Harbor. Boathouse focuses on providing guests with a classic and casual summer coastal dining experience. Dishes are crafted with locally sourced, fresh ingredients, served with an artful flair on their rooftop deck. This waterfront dining hotspot is one of the newest additions to the Boothbay Harbor area, and it’s sure to be one of your new favorites. The father and daughter chef team at Brady’s Restaurant cooks up various home-style dishes to delight your taste buds while their oceanfront location delights the rest of your senses. Plus, it’s open year-round, so you can stay cozy during those Maine winters with a fantastic, warm meal. The Carriage House Restaurant is back after several years of vacancy, and the new owner has revived a local Boothbay treasure. It’s home to a comfortable, friendly atmosphere and an enticing menu of ribs, fish & chips, lobster dishes, and more. Save room for dessert so you can try their crème brûlée and local pies! It’s no secret that fresh Maine lobster is the best of the best, and anyone who has had the chance to try it can tell you why! 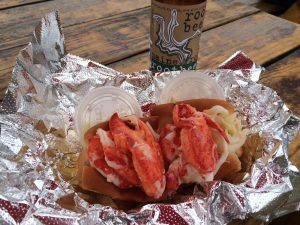 Pay a visit to Shannon’s Unshelled in Boothbay Harbor, where you can find one of the best fresh Maine lobster rolls out there. Whether you need an afternoon pick-me-up during your Midcoast adventures or you’d like to satisfy your sweet tooth with some freshly baked treats, Red Cup Coffeehouse has you covered. It’s a popular gathering spot for locals and visitors to enjoy warm specialty beverages and relax in a friendly atmosphere. With so many incredible restaurants in our area, we highly recommend extending your stay to try them all. You and your taste buds won’t be disappointed. Topside Inn offers the perfect spot for relaxation, harbor views, and a welcoming coastal atmosphere in the heart of Boothbay Harbor, and we’d love for you to join us to see what makes our region so special. It’s quickly becoming a popular foodie destination, and our fresh breakfasts from local ingredients are an essential piece of that! 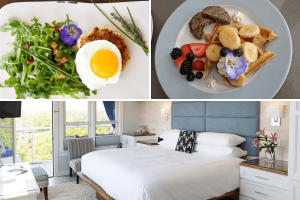 Take your pick from our variety of modern, coastal-themed accommodations and see what it’s like to unwind “above it all.” TripAdvisor named us as one of the top 25 hotels in the country for romance and service for a reason!